We had a really fun time here at Good Shepherd's Fold this afternoon! Right around lunch time, a team of women arrived from America. They have been corresponding with the missionaries on the team here and have been praying for us and asking what they could bring for us. They even brought some Scrabble cheezits for me to use while teaching reading! It was exciting to meet these women in person and we are all excited to have them here with us this week! They began to settle in and went for a tour of campus. We finished our school day and went outside to play with the toddlers. It was a fun time of pushing swings, giving hugs, playing chase, and visiting with the house moms. Elijah had gone on to play soccer with some of the older kids. After the game was over Elijah came back shouting, "A pangolin!" 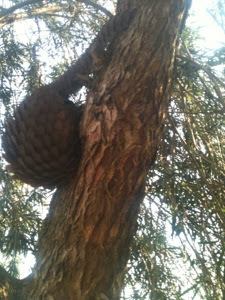 Some of the boys had discovered this unusual creature in a tree in our front yard! Many of you have probably never heard of a pangolin before, so I will tell you a bit about this animal. The closest thing I can compare it to in America is an armadillo. It has "scales" rather than the "armor" of the armadillo, but it is a mammal that eats ants and termites with its long sticky tongue, curls into a ball for protection, is mostly nocturnal, and has sharp claws for digging. It is a fascinating creature and is not commonly seen. Many Ugandans were not even familiar with it. Here is a photo before it climbed higher to get away from the children. After the pangolin excitement was dying down, the team of women began some fun activities for the older children at the pavilion across from our house. The kids were having a blast playing spoons, dancing, having snacks, and doing other fun activities. Some of the younger girls were watching, wishing that this activity was for them. (The team has special times planned for each different age group throughout the week.) I decided that this would be a good time to spend with them, so I took them back to the pangolin tree. Then I got out a field guide of African animals and took them through page by page looking at all the photos and telling them some interesting facts. They had seen some of the animals but had many questions. I really enjoyed getting to know these girls a bit more. Overall, it was just a fun afternoon here at GSF. Today the team has much more planned including a "tiny tykes and tunes" activity that Zeke and Bobby will get to participate in along with the toddlers and babies, and some Kindergarten activities where Ezra and Amelia can join the GSF kids. Tonight they have a game night planned for the missionary families. I think we will all have a fun week!